This canvas has been personally signed by NHL All-Star, Connor McDavid. McDavid has taken the NHL by storm earning five NHL awards in his first three years in the NHL. McDavid has taken home two Art Ross trophies, two Ted Lindsay Awards, and a Hart Memorial Trophy. 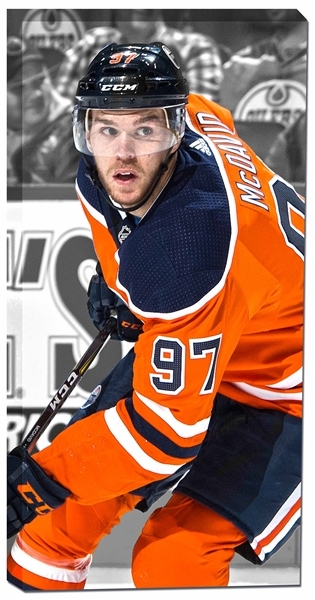 McDavid was also named to the first All-Star team in 2017 and 2018 and played in those All-Star games as well. McDavid has put up 100+ points in his two full NHL seasons. McDavid was taken first overall in the 2015 NHL Entry Draft. This NHL & NHLPA licensed product has been printed onto high quality art canvas. The canvas is professionally stretched and mounted on to the back of a 1" deep wooden frame. Perfect for any home or office and a unique addition to any hockey collection. FINISHED SIZE 14x28"